Might it be possible that the number of imperatives on this final list was not random but served in some purposeful way? For one thing, compositions that are 22 lines or items long appear in Hebrew literature, with that number corresponding to the number of letters in the Hebrew alphabet. As there is strong evidence for the presence of other Hebrew literary phenomena in the Book of Mormon, Moroni’s list of 22 commands might be something loosely comparable, at least in length, to an alphabetical acrostic—a composition in which each line or item begins with and features a letter of the alphabet. In the Bible, several examples can be found in which a Hebrew scribe composed an acrostic consisting, generally, of 22 lines, each line beginning with the corresponding letter of the Hebrew alphabet. Alphabetical acrostics appear in Proverbs 31:10–31, Lamentations 1, 2, 3, and 4, and Psalms 25, 34, 37, 111, 112, 119, and 145. Psalm 119 is perhaps the most famous acrostic, both because of its length and because the letters of the Hebrew alphabet are made explicit in our Bibles as a type of heading to the twenty-two strophes. Within each strophe there are eight lines, each of which (in the Hebrew text of the psalm) begins with the corresponding letter of the Hebrew alphabet. So, for example, the eight verses of the first strophe all begin with the first letter of the Hebrew alphabet, א (aleph). The lines of the next strophe all begin with ב (beth), and so on. Lamentations 2 is a more straightforward example. It has exactly 22 verses and each verse starts with the next letter of the Hebrew alphabet. Acrostics were likely used in ancient times as a mnemonic device or memorization tool to help individuals to more easily memorize and recite compositions. A modern example of this is the acrostic often cited by young biology students—“King Philip Came Over From Great Spain”—as a memory tool to recall biology’s taxonomic hierarchy: Kingdom, Phylum, Class, Order, Family, Genus, Species. In addition, this number may have been significant in Moroni’s eyes for other reasons. For example, the author of the Book of Jubilees, chapter 2, found it significant that there were 22 things created by God during the six days of Creation, and there were 22 patriarchs between Adam and Jacob. The author thus implied that the number 22 was “blessed and holy.” Thus, some Jews considered the number 22 to be a sacred number, although that belief is not attested in available sources earlier than the 2nd century BC. Thus, it is apparent that Nephite scribes such as Mormon and Moroni had a knowledge of the Hebrew language and of Hebrew scribal practices and desired to use them. Because we can assume that Moroni would have known the Hebrew alphabet, it is not hard to imagine that he would also have been able to recognize alphabetic acrostics on the plates of brass and applied or adapted that form in his own writing to give his writing a sense of traditional form and composition. The presence of famous lists with each item beginning with repeated grammatical elements, was well known to readers of texts such as the Ten Commandments. These repetitions served as scribal devices to help ensure the accuracy and completeness of the text. They helped audiences to take notice of these lists and to remember their contents. In drawing upon a traditional compositional device such as this, numbered lists also conveyed a sense of authority, veneration, and assurance that the hand of the Lord stood behind such passages and the blessings promised in return to those who would obey their injunctions (see Mormon 9:37). Thus, there are multiple reasons why Moroni may have given 22 commandments at the end of his first farewell text. Whatever the case may be, Moroni wanted his audience to pay special attention to these directions. The 22 points he listed were meant to help future readers cease despising the words of Christ, and begin to believe in the power of Christ’s salvation. Moroni taught them to prepare themselves to come unto Christ, to be worthy for baptism, and to serve God, enduring to the end, so that they could enjoy all the blessings of the Father’s ancient covenant with the house of Israel: “May he bless them forever, through faith on the name of Jesus Christ. Amen.” (Mormon 9:37). Donald W. Parry, “Hebraisms and Other Ancient Peculiarities in the Book of Mormon,” in Echoes and Evidences of the Book of Mormon, ed. Donald W. Parry, Daniel C. Peterson, and John W. Welch (Provo, UT: FARMS, 2002), 155–189. J.A. Motyer, “Acrostic,” in The New International Dictionary of the Bible (Grand Rapids: Zondervan, 1987), 12. John A. Tvedtnes, “Since the Book of Mormon is largely the record of a Hebrew people, is the writing characteristic of the Hebrew language?” I Have a Question, Ensign, October, 1986, 65. Note that if #20 and #21 are separate points in the acrostic, they do not have their own verb but are governed by the verb “condemn” from #19. This, therefore, would appear to be an example of the ellipsis of the verb, also known as “gapping,” that is a recurring feature of Hebrew poetry. This phenomenon can be seen in the acrostic Psalm 33, where the verb “made” in v. 6 is gapped in the second half of the verse. Likewise, in v. 11 the verb “stands” is gapped in the second half of the verse. Then v.12 begins with a gapped verbless statement “Blessed [is] the nation…” See John A. Cook, “Verbal Patterns in the Psalms,” SBL Presentation (Washington, D.C., 2006), accessed online at: https://ancienthebrewgrammar.files.wordpress.com/2010/05/verbal-patt-pss-sbl-2006.pdf. 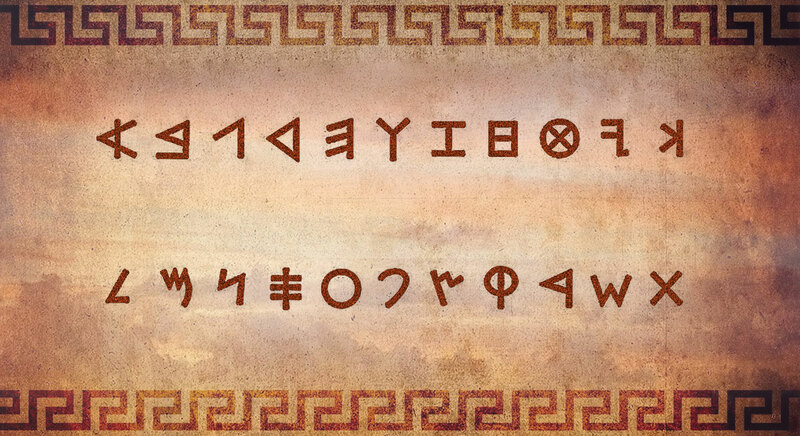 The Hebrew alphabet that would have been known to the Lehites would likely have been what is now known as the “Paleo-Hebrew” alphabet, a variant of the Phoenician alphabet, as depicted in the header art of this KnoWhy. Regardless, both of these, as well as the later “square-script” Hebrew alphabet, contained 22 letters. “Adam’s first act after being created and being placed in the Garden of Eden was to name all living things. Ever since that first human act, humans have named and classified living things in their environment, a process that scientists continue today. At times the names and classifications need to change in order to achieve greater clarity and precision. Beginning in 1990, scientists added another level of classification above that of kingdom: the domain. Scientists describe three domains of life, currently including Archaea, Bacteria, and Eukarya (with potentially two other domains being Prionobiota and Virusobiota). Biology students will need to update their acrostic mnemonic to ‘Determined King Philip Came Over From Great Spain.’” -Taylor Halverson, Nov. 10, 2016. See, e.g., John A. Tvedtnes, “Since the Book of Mormon is largely the record of a Hebrew people, is the writing characteristic of the Hebrew language?” I Have a Question, Ensign, October, 1986, 65; Donald W. Parry, “Hebraisms and Other Ancient Peculiarities in the Book of Mormon,” in Echoes and Evidences of the Book of Mormon, ed. Donald W. Parry, Daniel C. Peterson, and John W. Welch (Provo, UT: FARMS, 2002), 155–189; Andrew C. Smith, “Deflected Agreement in the Book of Mormon,” Journal of the Book of Mormon and Other Restoration Scripture 21, no. 2 (2012): 40–57; John W. Welch, “Chiasmus in the Book of Mormon,” in Chiasmus in Antiquity: Structure, Analysis, Exegesis, ed. John W. Welch (Provo, UT: FARMS, 1998): 198–210; Kerry Muhlestein, “Insights Available as We Approach the Original Text,” Journal of Book of Mormon Studies 15, no. 1 (2006): 60–65, 63–64; Matthew Bowen, “Onomastic Wordplay on Joseph and Benjamin and Gezera Shawa in the Book of Mormon,” Interpreter: A Journal of Mormon Scripture 18 (2016): 255–273; Matthew L. Bowen, “‘They Were Moved With Compassion’ (Alma 27:4; 53:13): Toponymic Wordplay on Zarahemla and Jershon,” Interpreter: A Journal of Mormon Scripture 18 (2016): 233–253; Matthew L. Bowen, “Nephi’s Good Inclusio,” Interpreter: A Journal of Mormon Scripture 17 (2016): 181–195; and many others. See Neal Rappleye, “Learning Lehi’s Language: Creating a Context for 1 Nephi 1:2,” Interpreter: A Journal of Mormon Scripture 16 (2015): 151–159; Stephen D. Ricks and John A. Tvedtnes, “Notes and Communications — Jewish and Other Semitic Texts Written in Egyptian Characters,” Journal of Book of Mormon Studies 5, no. 2 (1996): 156–163; Book of Mormon Central, “Did Ancient Israelites Write in Egyptian? (1 Nephi 1:2),” KnoWhy 4 (January 5, 2016). could these 22 commandments also be a form of chiasmus? In that the 1st and the last potentially have a relationship the second and the second to the last have a relationship so on and so so forth? Perhaps rather than a true and hard fast chiastic structure they are a loose chiastic structure of don'ts and dos. Just a thought.